Yeah, so this came across my transom recently, and it’s not…good. Not even by D5D standards. There’s a lot to dissect here, a lot of threads to tug on to unravel the knotted misery of this title, but let’s start with the title as a gaming supplement. Does it work for what it is? That’s a much more productive use of time than delving into the marketing that surrounded its release. This represents a perfect distillation of everything wrong with supplement creation today. It’s a narrative. A linear tale told by the writer to the reader, with only a passing thought given to actual play. 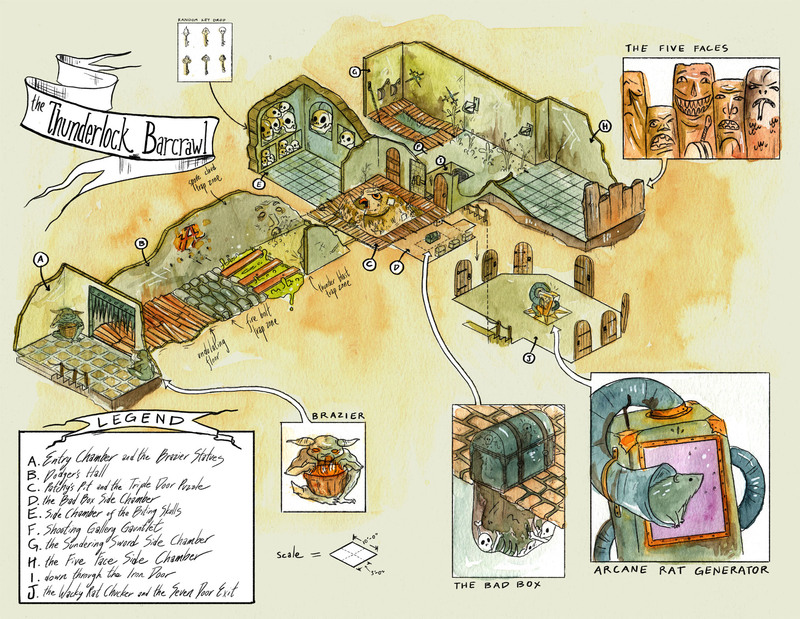 This utterly non-Jaquayed funhouse dungeon is a level of silliness we should have left behind with TSR’s Slaver series. Thirty pages to cover six rooms (depending on how you count them) will give poor old Bryce an aneurysm if he ever reviews this thing. Lion Forge is a comic book company, and it shows. The art is good, the story has twists and turns, and you don’t even need to play this to get the full appreciation for it. It’s a nice little read that you can enjoy, then place on your shelf with all of the other nerd-signallery bric-a-brac that gathers dust. You can pose with it in front of your stuff shelves to show what a totes nerd you are, tee hee. But play with it? I mean, you *could* use this to run a game session. In the same way you could use a Jack Vance story to run a game session, sure. But under that way of thinking, every movie, TV show, comic book, and novel ever told could have a D&D logo slapped on it. And that’s the real problem here. This thing will likely sell like hotcakes, because it targets the “D&D community” and not “D&D players”. It’s an odd simulacrum of a gaming supplement, but it’s the pale shadow of a tenth generation mimeograph. Fun, perhaps, but made for reading, or perhaps for storytelling, but not really for gaming. And you’d thinking gaming, and use at the table, would be the first things to consider in a supplement for a role-playing game. What with the word “game” being right there in the title. But in these Humpty-Dumpty days, when a word means just what the entryists choose it to mean—neither more nor less – who can say what “a game” really means? To say nothing of what “D&D” means. To we old school gamers, it means a game that you play, and then back-bolt a story on top of once you’ve rolled your dice and moved your mice. It’s a rough game of risk and reward played with the cold, hard math of probability and the unrelenting whims of the fates as they guide those polyhedrons. To the modern gamer, it’s the mean girls table where the dice present little obstacle compared to the aims and goals of the other players, and a past-time where negotiated results are key and “Yes, but,” represents the pinnacle advice to keep people feeling engaged and happy with the outcomes that mostly line up with their expectations. To them, the story is the cake, and the dice and rules are a frosting laid thin over the top of it. These are two very different past-times, and they really need two different names to distinguish themselves. Consider this analogy of an exchange, streamlined, but an accurate representation of many of my D&D conversations on social media these days. Fake Gamers: Our football game takes only two players, twelve disks, and an 8×8 grid. Jump, capture, and king! Me: That’s not football. That’s checkers. FG: We like our version of football. Me: Why call that football when it’s clearly checkers? FG: OMG! Stop gatekeeping football! Trying to use Thunderlock Barcrawl in a game of D&D would be like trying to use Thunderlock Barcrawl in a game of Monopoly. Using Thunderlock Barcrawl to tell stories might work great, but I can’t judge it based on that criteria, because my stories are all carefully crafted narratives, and not just a bit of improv using D&D as a little blue notecard to help cover up my player’s lack of creativity. Each dragon and each hero is unique and well-drawn, and the collection shows that the genre of dragonslaying tales has plenty of room for novelty and creativity without discarding its fundamental axioms.